Today, I wanted to jot down a few thoughts about the Sisters of Silence rules that were released by Games Workshop alongside their Prospero boxed set release this weekend. In terms of the stat line, these women are very similar to their 40k analogues the Sisters of Battle. 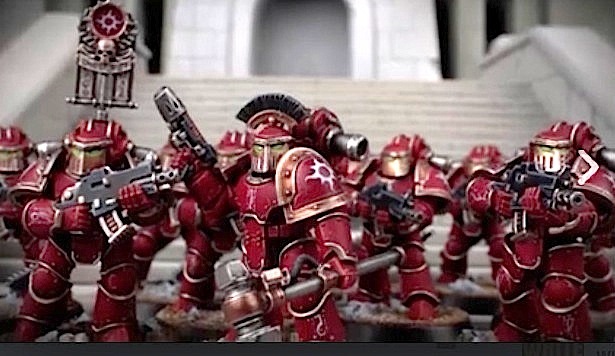 Lacking a pip in both strength and toughness means that they're going to suffer from incoming firepower rather severely compared to regular space marines. Obviously, we're going to want them to take transports or drop pods if at all possible -- but that's something that they haven't got access to just yet at least. Sadly. It is their special abilities that are really of note to be honest. Swapping out bolters in favour of flamers is a nice move for hard units stuck in cover. But the better swap out is in favour of executioner great blades. Swinging at initiative=5 for AP2 is fantastic. Doing so at S+1 is even better. They will chew through space marine squads and possibly even terminators very nicely. Clearly they might suffer a lot in return, but they should make their points value back very easily if they actually manage to make it in to combat. More than this, the trouble that they are capable of causing in 40k or 30k against psykers is fairly impressive. Nowhere else in the codexes or in the entirety of the game have much similar to what they're capable of -- especially when in their specific formation. Precision shots and strikes against psykers are very nice for starters. But the manifestation of warp charges on 6+ coupled with the leadership penalty is simply amazing. Couple this with not generating any within 12 inches means that a few squads of these sisters can shut down an entire tactica of certain enemy army builds. Its not perfect, but it is a huge dent, and little else in the game can compare. Certainly within 30k! Fear, Fearless and Psky-Out grenades simply add an extra layer of capability to their cause. In terms of their 40k formation, the Null Maiden task force, enemy players generating fewer warp charges just because the their sheer presence on the battle field is unheard of pretty much. For the points cost, I think these sisters are very much worthwhile if utilised well and will earn back their points in close combat in all probability. The problem will be to keep them from being the focus of enemy fire power. There's probably some combination with a fortification that might be good in here, but even on their own, some 225 points for 15 models each with AP2 at initiative is amazing. Today, the turn of the Iron Hands with a large picture from the glass cabinets of Warhammer World. I really like the tanks and the Terminators, naturally! Of course, the Iron Hands feature heavily in the Isstvan V diorama that I posted about earlier, also viewable at Warhammer World. Although the colour scheme of the Iron Hands is not one that personally appeals to me, I really like the vibe that this particular paint scheme communicates. The turn of the Blood Angels today. Only one image here however, as clearly this is a legion that hasn't had too many special models added to it for obvious reasons (at the time of writing and at the time of the exhibit). Although I might have liked to have seen some more decorations on these marines (like the Emperor's Children), these marines are very crisply presented with some nice variation in the squad leaders and characters, plus vehicular markings. Carrying on with a visitation to the legions of the Horus Heresy, today we have the Night Lords. These images (like the others in this series) was snapped at the dedicated special exhibit at Warhammer World (no longer on though!). I'm posting these here as a painting reference, and as a bit of a nostalgia about my visits to Warhammer World itself (one the the advantages of being in the UK I guess!). Today, some Imperial Fists from the Horus Heresy era that were snapped at Warhammer World. They were part of the special display dedicated to the Heresy that happened much earlier (and is now not there). I'm posting it here for posterity, and as a bit of a painting guideline. Enjoy! The "Get You By" Rules for Leman Russ were released alongside the pre-orders for the model from Forge World this weekend. In the absence of the full rules (which will be detailed in the forthcoming book: Inferno), these rules are supposed to at least provide a way to field Russ in battles as a Lords of War choice for an appropriate army (Space Wolves, of course). Here is a link to the rules themselves. As can be seen, at 400 points, Leman Russ is actually one of the cheaper Primarchs. Not that there's anything wrong with that -- Primarchs are beasts in the game no matter what -- even Alpharius is amazing against most things in the game (except almost any other primarch! Sure, he's weak, but that's not the point). The stat line for Russ is comparable to many of the other Primarchs. Stand outs include the WS=9 characteristic. Alongside this, he has all the regular rules associated with primarchs (It Will Not Die, Eternal Warrior, Fear and all the rest). His save is like that of a Cataphractii terminators at 2+/4++ which is rather nice. But the equipment is very much a placeholder. His paired melee weapons are little more than a counts-as power axe and paragon blade, with a comb-bolter at range. The Sire of the Space Wolves is just a legion vexilla. His other special rules amount to little more than an ability to confer the crusader rule and the counter-attack rule. Its all a bit bland to be perfectly honest. That's all folks. Very bland and very "counts as". Speaking of that, I actually kind of liked the use of the very words "counts as" -- its almost as if the game testers are actual gamers at Forge World :) (yeah -- of course they are! Its Forge World! Woo!). Right now, even Alpharius would probably beat Russ in a straight fight (Alpharius has the pale spear for one, providing AP1 … and Alpharius doesn't believe in straight forward fights either). Hence I can only assume that the real rules will be much better when released, and I would expect that the points cost for Russ will rise in line with any Inferno update. Only a single image of Legio V, the White Scars, from Warhammer World when they were on display in the cabinets of the special Horus Heresy exhibition earlier in the year. This squad uses the Forge World resin upgrades for the White Scars and is painted in the traditional colours accented with gold. And today on to Legion IV: the Iron Warriors of the Horus Heresy era that made an appearance in the cabinets of the special Horus Heresy exhibit at Warhammer World. Got to love those hazard stripes. Don't forget to look in the reflections for some added details as well. Continuing with the cabinets of the Horus Heresy special exhibit, today we turn to the Emperor's Children legion. Again, these are miniatures and paint schemes that I'm simply posting as a guide for myself or others at a later point! As part of the special Horus Heresy exhibition earlier in the year, there were a good number of cabinet displays of most of the main legions involved in the Heresy on display. Naturally, I snapped a number of photographs of the exhibits which, in this case, were painted by none core GW staff. My thinking was that I would use them as painting reference points if nothing else. So today, I'm starting off this mini-series with the Legio I: the Dark Angels. These images contain miniatures from all aspects of Eldar (no pun intended), including Dark Eldar, Harlequins and the Craft World Eldar themselves. Although I've not got any snaps of aspect warriors, these miniatures are representative of the resplendent painting schemes that are to be found in the cabinets around the major displays of the halls of Warhammer World. 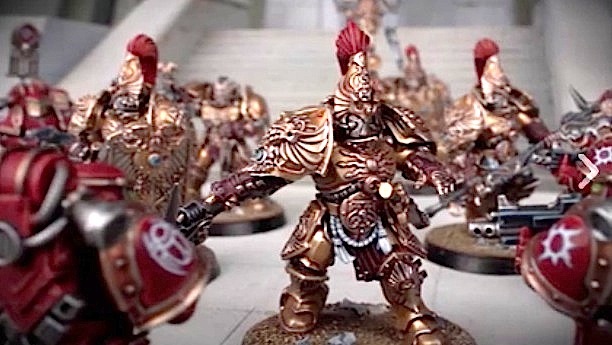 As if I wasn't excited enough by the video made by Warhammer TV of Magnus the Red, they've stepped it up with a video of Prospero Burns -- the new board game extension to the Horus Heresy. Indeed, it seems that whenever there is a leak (or the very likely potential for a leak), the Warhammer TV team are already a step ahead with a recorded video to make us, the consumers, exceedingly happy. Seeing the Daemon Prince version of Magnus is one thing. 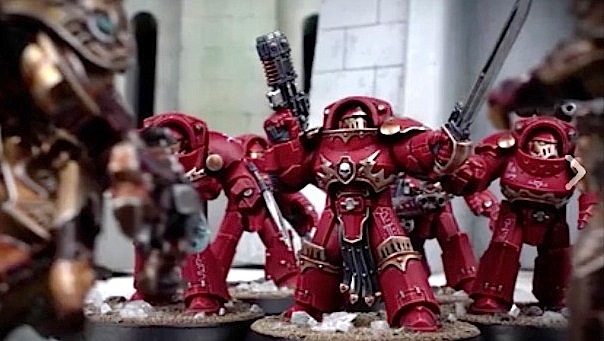 Having hints about sisters of battle in plastic and thousand sons in plastic is another. But now. Now. Now we have Prospero burns: plastic tartaros terminators, Ahriman, Sisters of Silence, Custodes. Oh, and not to be forgotten: Thousand Sons and Space Wolves (with what looks like to be new water based decals. I decided to grab a few screen shots of the Warhammer TV video. Just because. I've applied a few filters to make them a bit brighter and sharper, but otherwise, they're the same as per the video. Updating progress on my Alpha Legion Death Storm drop pod today. As can be seen, the painting has been improved in some areas, but the fine detailing has not yet been begun for it. It follows the metallic blue colour that I've established for my other unit; details of which can be found here. On the top of the painting, I've added one of the Forge World decal / transfer sheet icons for the Alpha Legion. These are great -- further examples can be found on my in-preparation assault squad. Still a fair bit to do on the drop pod to be honest, including hazard stripes on the interior of the doors, as well as fine detailing and some shading and edge highlighting to be accomplished on the main body of the drop pod. But its certainly looking much better now! Expanding in to the forces of the Mechanicum to support my Alpha Legion (or, indeed, any other legion that I might go for), today is a picture of my assembled Castellax sporting a dark fire cannon. Assembly has been very easy, except for the bit that I haven't yet attached -- the tubing that will connect the power pack of the dark fire cannon situated on the bum of the robot to the end of the shoulder cannon at the rear. I've been using the hairdryer as well as copious amounts of boiled water from the kettle, and I'm still not happy with the shape of it! I'll tinker a bit more but I think I'll just get it in to a reasonable shape and then pin it using a paper clip or similar. In terms of how I might field this Castellax, he is either going to go with a Legion Praevian and be an inductee of a legion, or be part of a small Mechanicum allied force (and potentially be a troops choice in there). His duty is moderately simple: to target enemy vehicles and monstrous creatures, whilst sitting on top of an objective, potentially, as well. The enemy therefore has to either suffer a rather powerful shooting enemy every turn, or commit some serious forces to dislodge and engage it. A downselection of a few of the tyranid cabinets at Warhammer World this evening. I really like the sheer number of the smaller beasts all packed closer together, just like the hive mind intended from the outset! The colouring of the purple brains is also really appealing to me for some reason. I'm not going to dwell on that thought too much though, its probably not healthy! Today, a down selection of the Ork Cabinets that are on display within the hallowed halls of Warhammer World in Nottingham (UK). I really like the top image here, but I'm also fond of the (now) very old sunburst with the grinning face in the centre of it. That particular image takes me back many decades to the very earliest of Rogue Trader days -- and Warhammer Fantasy days too. Yes, its associated with the Evil Sunz these days, but I think it made appearances in other publications along the way if memory serves. Following on from what seemed to be a rather popular post yesterday on some of the cabinets at Warhammer World, today is a selection of the necron goodies on display there. I really like some of the colour schemes in these, as well as the rusting and weathering effects that have been deployed. Some assorted chaos miniatures from the glass cabinets in Warhammer World today. I'm mostly posting these as reference materials for myself, but I hope that they also inspire readers as well! Well, yesterday's post asking what to do with resin cast offs produced a wild array of hits and numerous comments published on the blog, as well as emails written to me from multiple sources. Today, I wanted to just pull some of them together as a mini-resource … it's not earth shattering, but its at least a few thoughts on what can be achieved with all those cast offs. * Debris and basing materials. Admittedly, this is not highly original, but those cast off bits of provide an excellent source of raw materials ready to be chopped up and finely diced to be glued on to bases. * Barricades -- the pieces can readily be cobbled together to form a "junk" barricade like some of the resin walls sold by games workshop and others. * Tank Traps. Also known as Dragon's Teeth. Select the more symmetric pieces from the cast offs -- the ones with a square base. They can readily be used as tank traps or a fixed scenery piece. * Utilitarian pews for an Imperial Church. * Concrete barrier (Jersey barriers). Arguably another obvious use for these pieces, especially for any terrain that is urban-based.